Higher Education Commission declares the HEC Indigenous scholarship 2018 students of Balochistan and FATA under ‘Provision of Higher Education Opportunities to students of Balochistan & FATA’ for undergraduate students in all disciplines. The HEC Indigenous scholarship 2018 is provided below. The applications are invited from the candidates, who possess local / domicile certificate of Balochistan province / FATA for award of the scholarships for the postgraduates and undergraduate studies in EC recognized public sector universities /degree awarding institutes r W-category private universities of Pakistan. Average Tuition Fee and other charges including Hostel Fee up to Rs.60,000/- per semester/year. Living Allowance of Rs.6,000/- per month with Rs.500/- annual increment. Book Allowance of Rs.5,000/- per Annum. Traveling Allowance of Rs.5,000/- per Annum. Initial Settlement Allowance of Rs.10,000/- (Once during the total study period). Applicant must possess Local/Domicile Certificate of Balochistan Province/FATA. Candidates must have completed 12 years education getting 60% marks in FA/F.Sc/I.Com/ICS/DAE or equivalent. Maximum age is 22 years on closing date of this program. Candidates must have acquired requisite academic qualifications on or before closing date of this program. The candidates with any other HEC / government scholarship are NOT eligible to apply for this scholarship. Scholarships will be awarded on merit and on quota of district / agency. Candidates will be short-listed on basis of Aptitude Test (conducted by HEC) score and academic credentials scores. The scholarship distribution ratio for students of Balochistan & FATA is 50:50. The printed copy of online application form duly signed. Attested photocopy of CNIC or form-B (candidates having age under 18 years) and Domicile/Local Certificate (Mandatory). Original deposit slip/bank draft/pay order/ATM Transfer Slip of Rs.200/- (Non-refundable) as the application processing fee, which will be deposited in favor of Director General Finance, HEC. The candidates will deposit fee at Habib Bank limited, in Account Number 17427900133401. Applicants submit the hard copy of the application form. Application form is provided on HEC website i.e. http://hec.gov.pk/site/PHOBF, and application form link is also given below. Please download application form and submit the complete application form to (Bahram Jan Sr. Project Coordinator, Human Resource Development Division, Higher Education Commission, H-9, Islamabad). Please visit HEC headquarters in Islamabad or regional centers located in Quetta & Peshawar for assistance. 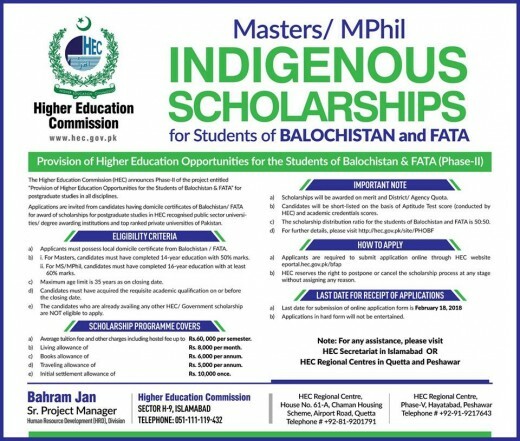 The application deadline HEC Indigenous Scholarship 2018 FATA & Balochistan Undergraduate Students is 19th August 2018. Here are Frequently Asked Questions. All of your questions will be answered here.